I’m writing this May 28, three days after the enforcement date of new European data privacy regulations – commonly known as the GDPR (General Data Protection Regulation). One of the unintended and more humorously ironic consequences of the much buzzed about May 25 deadline was the deluge of email everybody received in the week leading up it. Additionally, it’s clear to me that European regulators had a bit of a dark sense of humor. Don’t they know that you never set a Friday deadline for a technology or policy rollout? Don’t they understand that is the surest way to ruin everyone’s weekend? I’m convinced they were aware and purposely did it on both accounts. I have to imagine more than a few weekends were ruined by the mad scramble to send an email saying, “Our privacy policies have been updated” and bring digital marketing groups into compliance. Companies like The Los Angeles Times and Chicago Tribune decided to go dark for all EU citizens. Others – unsure if their lists were opt-in or not – sent emails saying “Uh, yeah, if you don’t opt in again – we’re going to delete you.” One company I’m aware of deleted more than 60,000 from its subscriber list. Again, those reactions were almost certainly overkill and have the firm stamp of a lawyer advising how to minimize any potential exposure. GDPR and the fundamental shifts in personal data management aren’t now (nor ever have been) an issue of legal policy or technology. Looking at the strategy of how marketers manage consumer data purely from a legal and/or IT perspective is a little like asking the local geologist about how to manage the impending disaster from a meteor strike. Marketers will not legalize or “software” their way out of the GDPR challenge. They must innovate, design, and create their way into the GDPR. 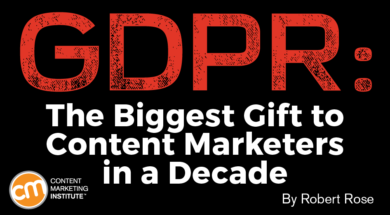 The one thing absolutely clear since we at CMI started talking about GDPR more than a year ago is that it is the biggest opportunity in more than a decade for content marketers to become strategic. The key to this innovation isn’t to give up on using personal data to optimize content and marketing strategies. It is rather to begin to care much more about the data we are being given. When someone grants permission they are acting consciously, becoming an active participant rather than a passive source of data to be pillaged. Permission equals engagement. And engagement is the ultimate goal here, isn’t it? If he didn’t just describe the central focus of content marketing, I don’t know what more to do. This is perfect to our business case. This active participation is critical – treating a subscriber (an audience member) as you would a customer from the beginning. We’ve written on this, where I called it “emotional data.” Data given, rather than scraped or gathered unwillingly, is simply more valuable as a marketing asset. Then it stands to reason that providing valuable content-driven experiences where the data is given willingly, trustingly, and actively is the way to not only comply but to thrive in this new business environment. Right? For anybody who has attended our workshops, consulting/advisory days, or events, you’ve heard my most current mantra, “We must become the trusted source of interesting things.” That isn’t just a content marketing mantra – it is a marketing mantra. Full stop. I’m going to add one more bullet to this job description (or at least an addendum to the segmentation responsibility): audience data shepherd. The audience strategist can be responsible for (if not directly managing) the data being collected by the company – and how it is managed carefully. Once you do figure out how to institute those (privacy) policies and begin data protection by design and other strategies then you’re in the position to create genuinely trust-based relationships with customers and prospects. Are you a trusted source of interesting things? It is clear that data and personal information are a critical aspect of the way you do your job as a marketer. Without it, you are hamstrung to guess what kinds of experiences your customers and prospective customers will find more valuable. Your competitors will have it. And you must have it too. To quote the mighty Yoda, you “must do or do not. There is no try.” Your ability to deliver more emotional, interactive, content-driven experiences will be the key to receiving insightful data from your customers. The choice is clear. You can hide behind increasingly thick walls of new privacy policies and technologies meant to mitigate risk. You can place more and more firewalls between you and your customers and slow the business down to a safe but ultimately unproductive speed. Transform owned media experiences from marketing tactics to something as precious and core as new products or services. Treat audiences of those experiences as you would customers of those new products or services. Measure those audiences in increasingly more strategic means of looking at content and data acquisition as a core fabric of your business. If companies begin to treat content-driven experiences with the same priority and care as the products they put into the marketplace, they can transform the purpose of marketing. It can go from a surveillance-based process of identifying the optimal targets for persuasion to a valuable experience where audience members are more than willing to identify themselves. When consumers happily, willingly, and trustingly give you data, it is a more meaningful and valuable asset for your business. Delivery of relevant interactive content early and often in their experience is a key piece of the evolving learning process of a broader content strategy. Traditional advertising, direct marketing, digital marketing, and even social media are all transforming. And all of them point toward a landscape where brands go directly to consumers, rather than relying on gatekeepers (i.e., traditional media) to get there. The only thing that prevented this in the past was the difficulty of getting in front of an audience. If you’re reading this blog, I don’t need to convince you that marketing is changing. But the interesting thing to me is the last sentence in Joe’s quote. As data has become more prevalent it has become the currency of your mining expeditions of getting in front of rented audiences. You relish it, savor it, and prize it as the “proof” that you are optimizing your messages and ultimately your marketing strategy. What content marketing promises is the ability to mine data ourselves; to become the trusted source of interesting things that gather an audience. The GDPR provides the powerful business case to do exactly that. Hear Robert Rose, CMI’s chief strategy advisor, in person and find the spark to innovate your content marketing program. Register today for Content Marketing World Sept. 4-7 in Cleveland, Ohio.